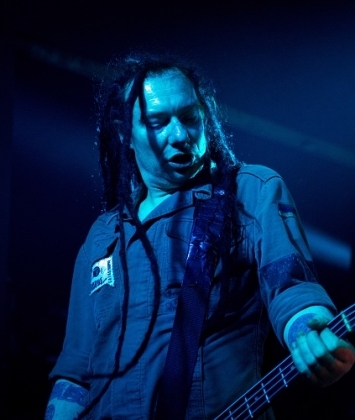 Tonights gig is like the rest of The Levellers current tour, sold out well in advance. The Levellers have a reputation as a superb live band, so I'm looking forwards to seeing them for the first time tonight. Knowing that the support on this leg of the tour is The Wonderstuff is a real bonus for me having long been a fan of theirs. Tonights gig starts early by gig standards due to the venue having a club night on afterwards. Despite the early hour the venue is packed out before The Wonderstuff take to the stage. Kicking off with "Red Berry joy town" from their 1988 debut album, "The eight legged groove machine", the band get off to a great start and quickly show why they are an excellent choice to support The Levellers. Halfway through the set they play "Welcome to the cheap seats", but rather than getting a female singer to sing the parts originally performed by the late Kirsty MacColl, they choose to replace her parts with a violin which works extremely well and the crowd clearly support their choice. As the set goes on the band trot out more and more crowd pleasing hits, but I felt the choice of "Ten trenches deep" was the wrong song to end the show with as they seemed to lose the crowd, whereas ending with "Golden Green" or "Give give give me more more more" - a more crowd pleasing song would have ended the set on more of a high. Despite this, they have set a high standard for The Levellers to beat tonight. After a short break for the crew to get things ready the lights go down and a long intro video plays at the back of the stage, showing news clips of confrontations with the police such as the poll tax riots, the stonehenge riot (The battle of the beanfield), and clips of politicians past and present (all of whom are loudly booed by the crowd). As soon as the video ends, The Levellers hit the stage. Right from the start they're jumping about and the crowd quickly follow suit. All through the set the fans are bouncing around or where there is space (near the bars at the sides of the room) then they are dancing instead. Most bands take a few songs to get up to speed but The Levellers start in high gear and keep on going like that throughout the show. The show tonight is part of the "Levelling the land" tour to celebrate the 20th anniversary of the albums release. The setlist is the first half of the album, followed by the B sides of the singles from the album and ending with the second half of the album. The encore is some of the bands other hits - "Hope street", "Carry me", "Cholera well" and then a second encore of "Beautiful day". 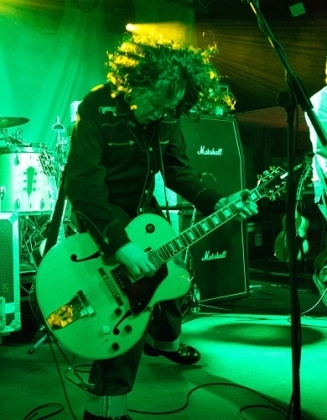 This was my first time seeing The Levellers, and it won't be the last. The atmosphere was fantastic - a real feel-good party atmosphere and anyone who hasnt seen the band should make the effort to go an see them - one of the best live bands around. As good as the band are on their albums, their live shows are where they truly shine.